Skilled Nursing costs are covered by Medicare if the stay is for post-acute rehabilitation (usually following an injury or illness requiring a minimum of three overnights in the hospital, for up to 100 days). Medicare monitors progress and may stop paying if it is deemed that the patient can no longer improve by staying at the SNF. Medicaid will typically cover a large portion or all of skilled nursing costs if an individual qualifies. “Share of Cost” is a question to ask of the admissions coordinator as well as your attorney. If Medicare discontinues payment for the reason described in #1, the choices for the patient are usually to either be discharged to home, to a facility with the appropriate level of care (assisted living or memory care), or stay at the SNF and pay privately . Private pay for Skilled Nursing is almost always considerably more expensive than the cost of Assisted Living or Memory Care. 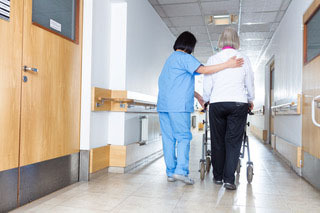 Although Medicaid theoretically will pay for care in a SNF when a patient qualifies, it is getting increasingly difficult to find “Medicaid beds” in Skilled Nursing facilities when long-term care is the goal. It is not uncommon that a patient is admitted to Skilled Nursing while covered by Medicare and to then transition to Medicaid if the patient runs out of money and qualifies for Medicaid coverage. Dementia patients with no other medical needs often end up in Skilled Nursing facilities due to lack of funds to obtain other types of care that are private pay (Memory Care, In Home Care). This is a less-than-ideal scenario but sometimes is their only choice. Skilled Nursing Facilities are not all the same. What you can count on, however, when thinking about long-term options, is that there is the likelihood that rooms will be shared and activities geared toward dementia patients are usually limited. PLEASE NOTE: These regulations and benefits can change based on adjustments made by Federal and/or State governments. Always check with an expert for up-to-date information.